Now, I’m living in Calgary and trying to get a handle on the online community here. I created a list of top Calgary online influencers last week (and then updated it) and have found it to be a useful tool for getting an idea of who’s who around town and the province. So, here is my list of Edmonton’s top social media influencers. Important notes: before you jump on me about who’s on the list and who’s not and what an “influencer” is (and is not), please read the notes below on my methodology in creating this list. The list is divided into PEOPLE and ORGANIZATIONS (see tabs below spreadsheet) and additional details can be seen by scrolling right and left. Full spreadsheet is here if you’re experiencing trouble viewing the embedded version on mobile devices. The Insider Score is the number that is associated with each report Insider. This number is calculated based on the number of other people within that topical community, who are following that particular Insider. For example, if a person has an Insider score of 458, it means that 458 other Insiders are following that person. There are two other scores reported by Little Bird. Listening score is the number of insiders any insider is following and Emergence score is a measure of how rapidly an insider is rising up the list. In addition to ordering the list by highest Insider Score, I separated all online identities into “persons” and “companies”. This is based on my own interest in identifying actual people (individuals, personal brands, if you will) who are actively engaged in social networks, as compared to organizations. There is an organizational list as well, but I find that personal accounts are generally more engaging than the corporate accounts. Not surprisingly, Mayor Don Iveson tops the list of online influencers in Edmonton, much as Mayor @Nenshi does in Calgary. Mayor Iveson is a savvy social leader who has long incorporated direct engagement with his audience into his daily activities. Other politicos high on the list are former mayor Stephen Mandel and Alberta Premier Rachel Notley. The other types of folks that you would expect to be on the list are there: municipal councillors, newspaper columnists, broadcast media personalities, and even some professional athletes. Generally speaking, these are people with built-in audiences and name recognition and they are wisely leveraging social media to build relationships directly with their audience. Personal brand matters to all of these people. Then, there are the community leaders and business owners that have stepped forward and created an audience with extensive reach into the online community. Most, I suspect, do this out of a genuine passion for social media and commitment to their city and community, but there are benefits to their personal visibility that can have a positive impact on their businesses and organizations. Not unlike the aforementioned Calgary list, I would point to a lack of charitable organizations represented on the persons list. Personal branding and thought leadership is a great way to boost visibility for these important organizations, yet their leaders haven’t quite figured out how to make it a priority. I know everyone is busy, but personal branding is increasingly important for not-for-profit leaders, just as it is for political and business leaders. 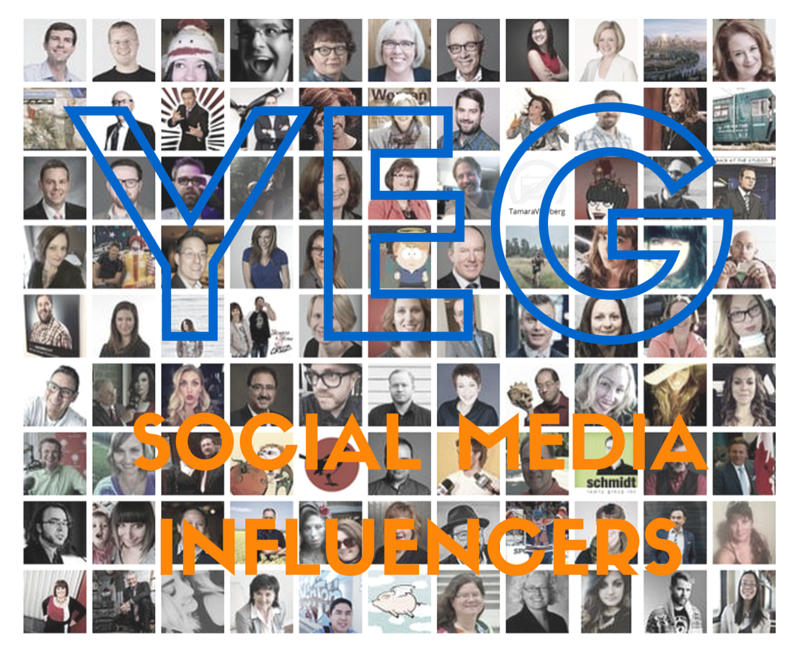 In the final analysis, this kind of influencer list has huge value if you want to get a handle on who has audience, reach and, I would suggest, influence on social media in Edmonton. Thanks for putting together this list, Jay! Definitely a good reminder to start the new year right and ensure I’m following even more great people (in Calgary too). And if you haven’t been following Addie’s world cheese tour, I highly recommend taking a spin through his tweets (and Instagram) but only if you aren’t hungry. You make reasonable points, but I’d more likely change the body of the article than the headline. Some kind of comprehensive analysis of influence across social networks would be valuable. That was what Klout was after a few years back, but they seem to have fallen from grace. There are a variety of other meta-influence measuring systems and quite a number of proprietary systems used by “influence marketing” firms. I think, in the end, you get a fair number of key influencers via the Twitter-centric methodology, though not admittedly all of them. Neil Patrick Harris? How’d he make the list? I guess he’s a bigger fan of Edmonton than I realized. Overall, a very valuable resource! NPH is there because of the fact that a large number of Edmonton Twitter influencers follow NPH. That make NPH a influencer among Edmontonians. Thanks for feedback.